Get a bird’s-eye view of downtown Tampa and the Manatee River on this exciting helicopter tour! After circling Davis Island and its beautiful homes, head to downtown Tampa for an aerial view of the city skyscrapers and local sights like the St Petersburg Times Forum. Then head south to the Manatee River, where the pilot will drop the helicopter low to the water so you can see bottlenose dolphins and manatees! Take a helicopter adventure in Tampa Bay to see downtown attractions and local wildlife. From the Peter O. Knight Airport, your pilot will take off to the west so you can admire the beautiful homes that dot the shoreline of Davis Island. From Davis Island, head to downtown Tampa, where you’ll have bird’s-eye views of the city. As you fly over the skyscrapers, look down on the St Petersburg Times Forum, the Florida Aquarium and the University of Tampa. 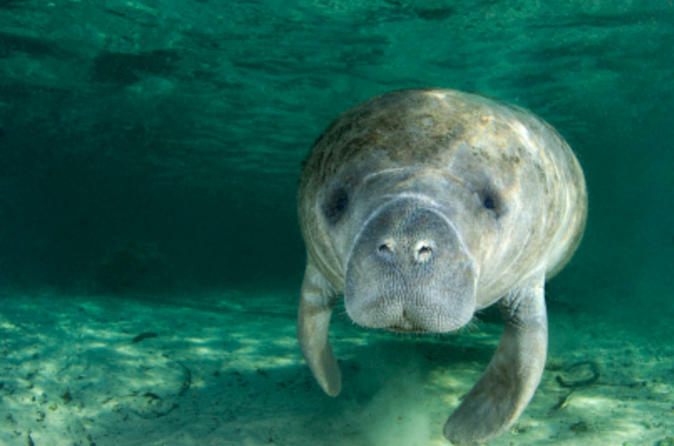 Next, head south to the Manatee River, home to more than 500 manatees and dolphins. Your pilot will drop the helicopter closer to the water to give you a better view of these loveable marine animals. You’ll then fly back to the airport.